A smart lighting solution. Sounds smart, doesn’t it? But for many, it’s a vague concept that seems a bit hard to understand. After reading this article, you will understand what a smart lighting solution means and how it relates to your business. 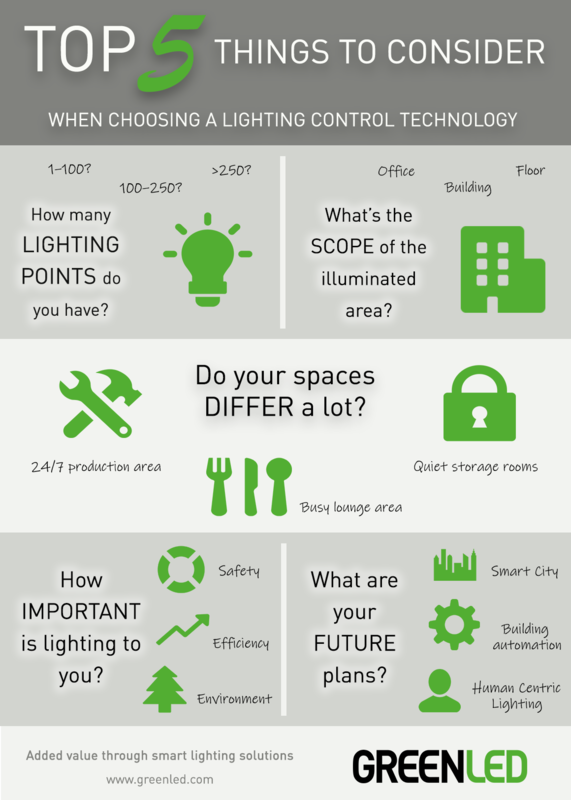 You’ll understand the benefits of smart lighting solutions and the different options you have for lighting control. At the end of this article, we will give you a list of top 5 things to consider while choosing a lighting control technology. When we talk about a smart lighting solution, we mean more than just the luminaires. Energy-efficient LED luminaires are the core, but alone they are only a part of a smart solution. A smart lighting solution consists of luminaires, lighting design and a lighting control technology. Together they make up a smart solution that allows you to use light where it’s needed, when it’s needed, resulting in significant energy savings and a bunch of other benefits. However, no solution is smart if it’s not a fit. Therefore, we emphasise the importance of choosing the right kind of luminaires, optics and control technology for each purpose. If your current lighting is running on older technology, such as fluorescent tubes or high-pressure sodium vapour lights, you’re most likely to achieve significant energy savings just by changing to LED technology. However, simply replacing the old lighting with LED luminaires will only bring you a part of the benefits you could reach. Paired with right kind of lighting design, optics and a suitable lighting control technology, there’s more to it. In retail, lighting plays a huge role in customer experience and purchase decisions. Just take a look at this case study of a department store, where the number of returns in clothing dropped significantly after switching to LED technology. With the help of smart lighting solutions, you could lead customers into your store, highlight certain products, encourage purchases or set up a certain mood. Light levels can be further optimised based on whether it’s time to clean, shelve or open up a store, for example. 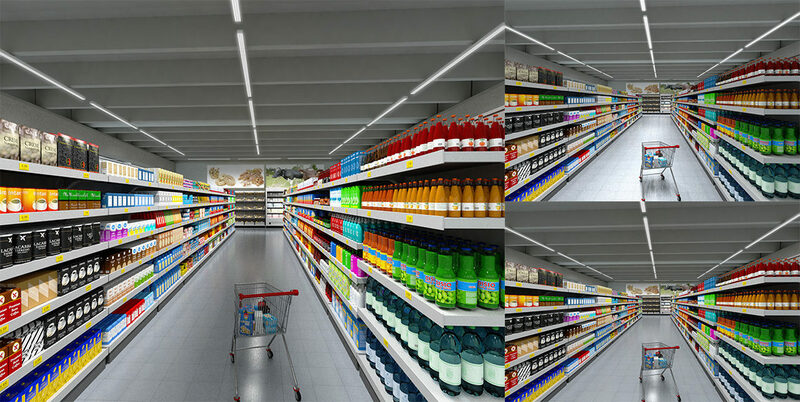 Image: Three different choices of lighting in one aisle. On the left, the designer has used Batwing optics to direct the light on the vertical surface of the goods. On the contrary, the upper right corner shows how a choice of narrow optics effectively illuminates the aisle. On the lower right corner, a wide light distribution evenly illuminates both the aisle and the shelves. Many studies examining the industrial working place show that lighting greatly affects the safety and productivity of the employees. Raising light levels by 200 lux could improve productivity by as much as 6 %, reduce mistakes by 8 % and cut down on work injuries by 14 %. But the benefits of high-quality lighting aren’t just restricted to the industrial context. The lighting world is bustling with the concept of Human Centric Lighting (HCL) understood as a major factor affecting the well-being and comfort of individuals at work. Human Centric Lighting aims to dynamically mimic the levels of sunlight thus affecting the circadian rhythm of individuals. At its best, lighting could react to individual changes in hormone levels and support the work efficiency and comfort of each employee. Compared to other light sources, LEDs emit very little heat. However, changes in the temperature greatly affect the lifespan of the luminaires. A 10°C degrees increase in temperature reduces the life of the luminaire by half. So how can you regulate the heat? First and foremost, you need to have high-quality luminaires where each component is carefully picked to ensure durance. “A chain is only as strong as its weakest link”, they say, and this is very true with LED lighting. Apart from ensuring the quality of the lighting fixture and its components, the best way to regulate heat is to make sure your lighting is on only when needed. Smart lighting controls will help you in that. Smart lighting design and carefully selected optics are an essential part of choosing the right luminaires. Instead of buying a bulk product, consider having the luminaires tailored to your needs. Let’s take an example form street lighting. Imagine a main street and a pavement on the side. First of all, choosing the luminaire for the main street requires many considerations, such as street profile, pole height and pole distance. The pavement on the side is another story. Apart from the main street, you want the pedestrians to feel safe too. But do you always need two separate poles? In this kind of situations, we’ve often used reversed optics to illuminate both the main street and pavement next to it using just one pole. Smart, isn’t it? As stated before, simply changing to modern LED technology will result in significant energy savings. However, paired with smart lighting control, the benefits are much bigger. 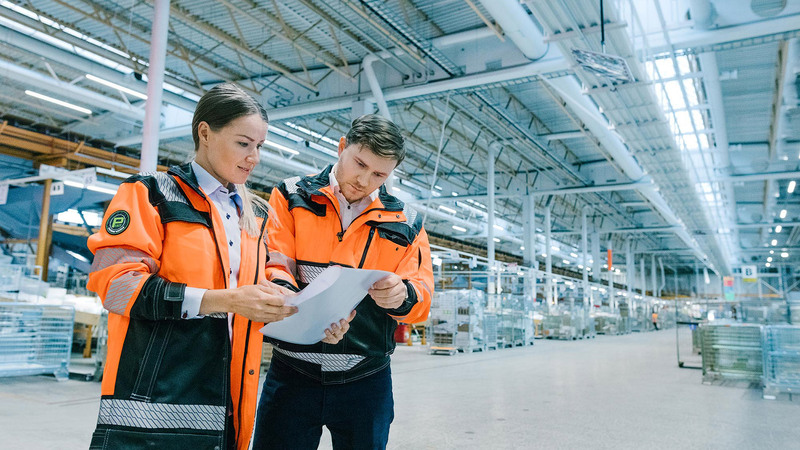 Depending on the case, the energy saving strategies mount for 10–50 % of added savings in lighting compared to a situation where the lighting is only replaced with energy-efficient LED luminaires. 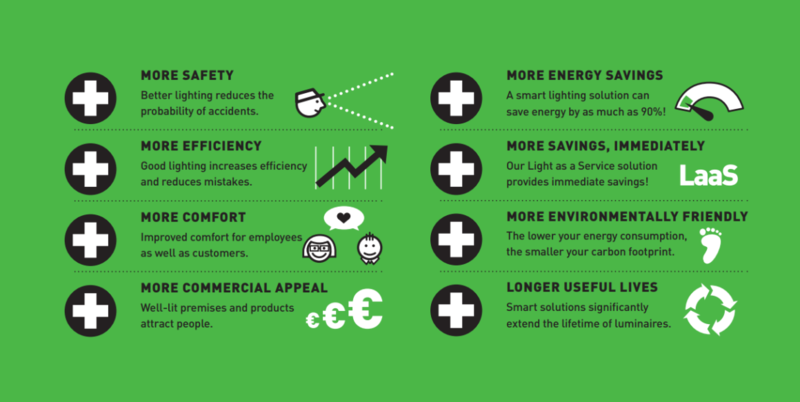 Image: Apart from energy savings, smart lighting solutions have a variety of other benefits. So, whether a store, a sports arena, a warehouse or an office, a smart lighting solution including design, luminaires and lighting control is definitely worth considering. But how do you know what type of lighting control technology would suit your needs? Let’s dig into that. Lighting control technologies can be divided into three main groups: stand-alone solutions, router solutions and light management systems. To get a rough idea of the scope, think of a tall building. If you’re managing only one office space in a big building, you’re most likely to choose a stand-alone solution. If you’re managing an entire floor with several different office spaces, you’re most likely to deal with a router solution. Moreover, if you’re managing the lighting of the entire building (or several buildings), you’re most likely to choose a light management system. Stand-alone solutions are a great option for anyone wanting to renew their office lighting to LED technologies, using the existing wires and switches, without any programming required. In such a scenario we are talking of 1 to a maximum of 100 lighting points. Stand-alone solutions are smart LED lights that each function as an independent unit, adjusting the light output automatically based on occupancy and daylight. Using sensors, a certain number of luminaires can also be controlled as a group. As an example of stand-alone solutions, check out Greenled’s Alfa product family perfectly fit for office spaces. If you have roughly 100 to 250 lighting points, you’re most likely to think of a router solution. A router solution allows you to create groups of luminaires that follow certain control. Depending on the property and purpose, these groups can be controlled with different sensors or buttons. The output of each individual luminaire can also be adjusted to fit its purpose. Router solutions enable a variety of different control methods, and you can easily expand them. Lighting control manufacturers have developed Bluetooth based control technologies that enable users to control lighting over a smartphone. This could be a great option for someone looking to adjust the lighting of a couple of different office spaces easily on-site. If you’re managing more than 250 lighting points, it usually indicates the need for a light management system. In such a scenario, a system enabling remote control and extensive reporting will bring you both cost-savings and flexibility. The biggest difference compared to stand-alone solutions is the ability to control individual lights, groups of lights or the lighting of several properties from a single user interface device. Centralized management allows a variety of different control methods as well as extensive reports on energy consumption or haulage needs, for example. A centralized user interface gives property managers insight on the utilisation rate of the properties as well as an interface to building automation. Nowadays, lighting control manufacturers are developing wireless lighting control systems using new technologies such as ZigBee and BLE. While new technologies arise, the lighting world is yet to tackle the challenge of standardization and interoperability. Our best advice is to concentrate on the usability, functionality and reliability while making sure the partner you choose has the ability to adapt and keep up with the latest technologies.